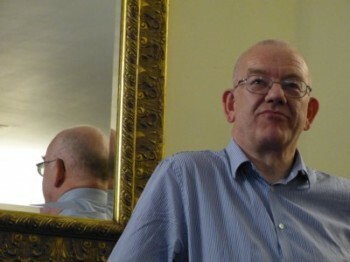 I have long admired the libertarian historian and activist Stephen Davies, my previous posting here about him being this one, in connection with a talk he recently gave to Libertarian Home, in the superbly opulent setting of the Counting House‘s Griffin Room, in the City of London. Here is another, together with a photo of someone else also photoing him. The Davies talk was predictably excellent, and this on a day when he had also given another talk elsewhere in southern England somewhere, to a bunch of sixth formers. I know this because I happened to share a tube journey with Davies afterwards, during which we talked about, among other things, his day, and why he was so very tired. I don’t recall where this other talk was, but do recall that it was definitely out of London and that Davies also organised for three other speakers to be present, as well as himself speaking. All this being part of the networking and speechifying enterprise that Davies masterminds from the IEA, along with his IEA colleague Christiana Hambro. LLFF2013 was but a London manifestation of a nationwide libertarian outreach programme. The way Davies seems to operate is that he has a number of set-piece performances on particular themes, each of which he delivers pretty much off the cuff, with almost intimidating fluency but which he will typically have done several times before you get to hear it. So, when a particular audience assembles, they get to choose from a menu. There’s that history of libertarianism talk, which Davies did for Libertarian Home, having previously done it for the Essex University Libertarians and presumably for plenty of others besides. There is a healthcare talk, which I heard Davies do at LLFF2013, which he also did for those sixth-formers earlier in the day of the Libertarian Home performance. And there are several more of course, which I also asked him about, during that tube journey. I know. He was by then just about dead on his feet, but just sitting there and not asking such things would have felt even ruder than picking his exhausted brain. A particular favourite of Davies himself, and of me now that I have heard about it, concerns history dates. History dates are essential, said Davies, and I entirely agree. How else are we to chop up the past into manageable tracts of facts, and relate these facts to those facts by noting that they happened near in time to one another, this one first, then that one, and so on? History can be chopped up and named and numbered, and if you want to get your head around it all and your memory properly stocked with facts, you must do this. But what do these dates say? By their nature they assert the importance of some kinds of facts, and the relative unimportance of other kinds. The history dates that I was taught at school mostly asserted the importance of kings and emperors and aristocrats and tyrants and their various struggles and battles against each other. 1066: Battle of Hastings. 1215: Magna Carta. 1485: Battle of Bosworth. 1649: Execution of Charles I. 1689: Glorious Revolution. 1745: Second Jacobite Rebellion. 1805: Battle of Trafalgar. 1815: Battle of Waterloo. 1940: Battle of Britain. That kind of thing. Other big dramas, following the modern media principle that if it bleeds it leads, concerned natural and other sorts of disasters. 1349: Black Death. 1666: Great Fire of London. These dates have all remained indelibly printed on my brain. You will notice that the dates I learned, at my posh little prep school in Surrey, a walk away from where I was raised, were very English in their emphasis. That the English constantly battled against foreigners was just a natural state of affairs. That we mostly won (the losses tended to be glossed over) proved that we were better than the foreigners. But, in and around dates of this sort, even the history I was taught at school (concerning such things as the invention of the spinning jenny), never mind my everyday life experiences, made it clear that other vaguer and more benign things had also happened, hence me and my family living in a nice house with indoor plumbing rather than a nasty one without any plumbing. Hence such things as medicine that actually did you some good, in something resembling comfort. Hence trains that took you to nice holidays rather than just to wars. Hence airplanes that took you to nice holidays abroad, instead of just airplanes that shot at each other and destroyed other people’s nice houses. Hence me being able to read about such things in lots of quite cheaply printed books, even when I was only ten. Hence gramophone records and the radio and TV. It wasn’t all bad news. But, mostly, history was bad news. History was presented as, on the whole, a Hobbesian scrimmage. The big questions all concerned who did what to whom and whether your team managed to get their retaliation in first, rather than who accomplished anything of lasting value, for everyone, and exactly what that was. And exactly when. I wrote all of the above, and then I googled my way to this, which is Stephen Davies doing this performance, in the USA, in 2010. I earnestly recommend this video talk to all Samizdata readers. It pretty much sums up everything that Samizdata has tried to be all about since it was started over a decade ago. I would even recommend persisting past the talk itself and into the Q&A, which, despite the long silences during which un-miked questioners talk inaudibly, is full of further good stuff from Davies. The total performance, including Q&A, lasts over an hour, but when I listened, the time just flew by. I lost count of the number of Samizdata Quotes of the Day that had me laughing out loud, my favourite one being that what we should worry about most is not political failure, but political success. Do you know any of those? Perhaps you did, but I didn’t. Oh, I knew about the things they flag up, but I couldn’t say which mere date was about what until Davies said. Which is exactly his point. Only three of those dates are after my birth. I flew from New Zealand to the USA at a few days notice specifically in order to observe one of them, as I felt that it was a significant historic event. I ran into a Samizdata contributor there. If I recall correctly, both Dale and I helped cook breakfast for those who slept on site the night before the event. Well, I was present for the events June 21, 2004 and blogged it here on Samizdata… and I will be present for the next set of steps of that sort as well. One thing about the Davies dates (pardon the alliteration) is that they are all quite recent, post-Waterloo. Presumably that’s because earlier innovations are more difficult to date. Going back to Brian’s “traditional” dates, what strikes me is that some of those events were enabling, so to speak: without the Magna Carta, the Glorious Rev., Trafalgar, Waterloo, and “our side” winning ww2, innovation would have been substantially slower; unless you think that politics is immaterial, in which case why read this blog? Political changes can happen suddenly, and are easily dated. Technological changes are less sudden, and not so datable. Which was more important: 1858, when the first trans-Atlantic cablegram was sent, or 1837, when the first commercial telegraph was demonstrated? Or 1866, when the first commercially useful trans-Atlantic cable was completed? Or 1924, when “permalloy” cable increased transmission speed from 40 to 400 words/minute? These dates might be compared to 1903 (first airplane flight), 1927 (first trans-Atlantic solo flight), and 1970 (first jumbo jet flight). There are also dates which are neither political nor technological: notably 1492. As to political dates representing good news: every American knows 1776. I think the point that Davies is making is one about the date that something becomes commercially available. Not the moment it gets invented but the moment it starts to do useful work. As such I’m not sure that Tim Berners-Lee counts but in that case what does? The first sale on Amazon? The first use of Blogger? The first tweet? The first Google search? Probably all of them. I would also add the first commercial satellite, the first commercial flight of the 707, and the opening of the London-Birmingham line. There are probably a whole bunch of medical developments like keeping the place clean and penicillin that we could mention.